I promised you a picture of my new hairstyle last week, remember? Well, here you go! 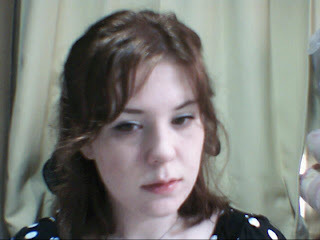 Uwah, I look super tired in the light! Plus, I had it dyed in a really dark colour which looked nearly black on the first day, but now, it is nearly back to my old brownish hue, just looking a bit more reddish. Huh? I should have known that my hair is undyeable, but how this happened when the hair stylist really dyed it is incomprehensible to me.